Emma Masters is an advanced nurse practitioner in the Royal Marsden NHS Foundation Trust’s Oak Centre for Children and Young People in Sutton, Surrey. After she qualified as a nurse in 1999 from the University of Surrey, her first role was on a medical ward with acute haematology patients. 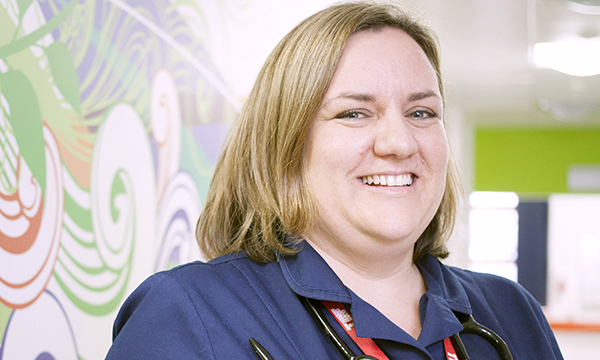 She developed a love of haemato-oncology nursing, an area she has worked in ever since. Her previous roles include sister on a haematology ward and haematology clinical nurse specialist, and she gained a master’s degree in advanced nursing practice in 2012. In June, she featured in a programme for the BBC Horizon documentary series, filmed at the Oak Centre, showing how specialist services are helping teenagers and young adults get on with their lives while undergoing cancer treatment. Daily clinical reviews of patients on the teenage and young adults ward to ensure they are fit enough to start chemotherapy. I also manage any side effects from treatment and review patients who become unwell during treatment, order investigations and discharge those who are fit to go home. Having worked in adult haematology-oncology for many years, I saw firsthand some of the struggles young people face when going through chemotherapy. I sought specialist training, completing a teenage and young adult cancer course, and the role at the Royal Marsden came up shortly afterwards. Young people aged 16-24 who have cancer and are undergoing treatment, including many patients with a haematological diagnosis. The young people I work with. They just get on with it, even though they would much rather be out with their friends. We could all learn a lot from their tenacity and positive attitudes. Some young people don’t always agree with aspects of their treatment, usually around supportive interventions and medications. It can be frustrating if a patient is constipated, for example, but the anti-constipation medication sits idle on their table. Ensuring all my patients are safe, so giving chemotherapy on schedule and managing any side effects promptly. I am constantly ‘on site’ so there are no delays to starting treatment. Working entirely clinically has enabled me to hone my assessment skills, and I am confident in managing patients with complex needs and liaising with senior clinicians. I continue to develop leadership skills, and teach and support junior staff. My first job on a general medical ward was one of the busiest jobs I have had. I learnt so much, including how to cope under stress, work in a team and take charge in challenging situations. I have always loved history, so something in that field. Compassion, patience, empathy and resilience under stress. There will always be challenging times in nursing and in life, but it is important not to let it overwhelm you. Keep calm and ask for help when you need it. Take every opportunity to learn and gain experience, and challenge yourself. Think of your career as a Christmas tree – at the bottom, keep your experience broad and thorough. As you progress it will become more focused and specialised. At the top you will be a star!